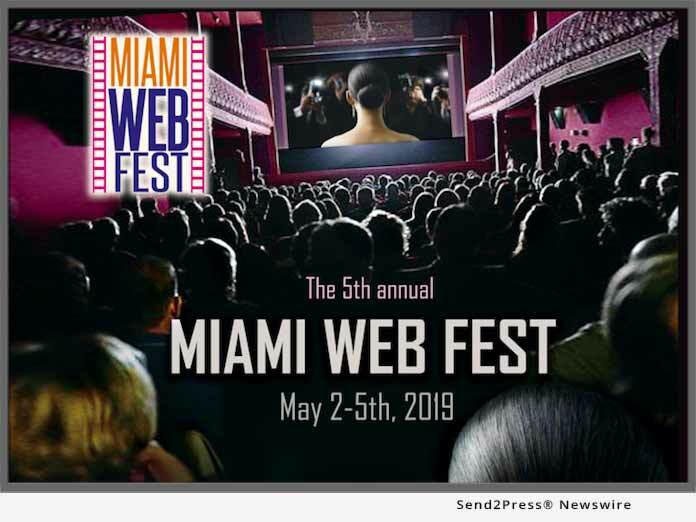 MIAMI, Fla., Mar 29, 2019 (SEND2PRESS NEWSWIRE) -- The 5th season of the Miami Web Fest and the Veteran Film Awards takes place May 2-5, 2019 at the Fillmore Miami Beach. The first of its kind in the state of Florida, this event showcases the best digital series from over 30 countries and also highlights the work of veterans. It is designed to allow the general public to see independently produced shows before television networks discover them. Miami Web Fest is different by design. "It's a new type of festival for a new type of filmmaker," says founder Bryan G. Thompson. "Just like the traditional creators of short films and feature films, creators of digital series need a forum to showcase their work directly to the public and discuss it face to face. They also want to interact and network with executives and celebrities in a relaxed environment. That is why we exist." Miami Web Fest also includes a Pitch Fest, where filmmaker pitch their original concept directly to network executives. Pitch Fest and the main competition will be judged by executives from major networks and film distribution companies. Confirmed judges include Grant Housley (Paramount Pictures), Rainer Lorenzo (Viacom), Silvia Edgell (HBO Go), Vanessa Cruz (HBO), Maria Eugenia Contreras (HBO), Jordan Brenner (Vimeo), Doug Schwab (Maverick Entertainment), and Chevonne O'Shaughnessy (American Cinema International). Celebrity guests include Emily Swallow ("The Mentalist"), Scott Lowell ("Bones," "Queer as Folk"), and 10-time Emmy Award nominee and Golden Globe Award Winner Sharon Gless. Sharon Gless is an Emmy Award winner and a Golden Globe Award winner, and has been nominated for 10 Emmy Awards as well as 7 Golden Globe awards. She has also received a star on the Hollywood Walk of Fame. She is also iconic among the Miami film community for her role as Madeline Westen in the popular television series "Burn Notice." Gless is also a supporter of the web series community and currently plays "Mary Elizabeth" in the series Adoptable. The festival was founded by award-winning filmmaker and US Army veteran Bryan G. Thompson. Thompson's long list of credits includes the short film "Noventa," a drama highlighting the "wet foot dry foot" law, and most recently the feature film "El Sue no," a drama which highlights D.A.C.A. and the proposed Dream Act. "El Sue no" won Best Feature at the Festival de Cine Latinoamericano, secured a distribution deal, and is now streaming on Amazon Prime. A special screening of this film will take place during the festival, featuring celebrity guests and a Q & A with the stars of the film. A graduate of the University of Miami School of Law, Thompson is a recipient of the Key to the City of Miami, which he received for his cultural contributions. The Gala Awards Ceremony will take place May 5 with the Red Carpet Cocktail Party beginning at 4 p.m. and the Award starting at 6 p.m. The event is co-hosted by Emmy-nominated TV Anchor Stephanie Bertini of NBC 6 and Chief Meteorologist Betty Davis of Local 10 News.